Very few franchises that are designed to work for younger gamers have been able to capture my attention as much as the LEGO titles. 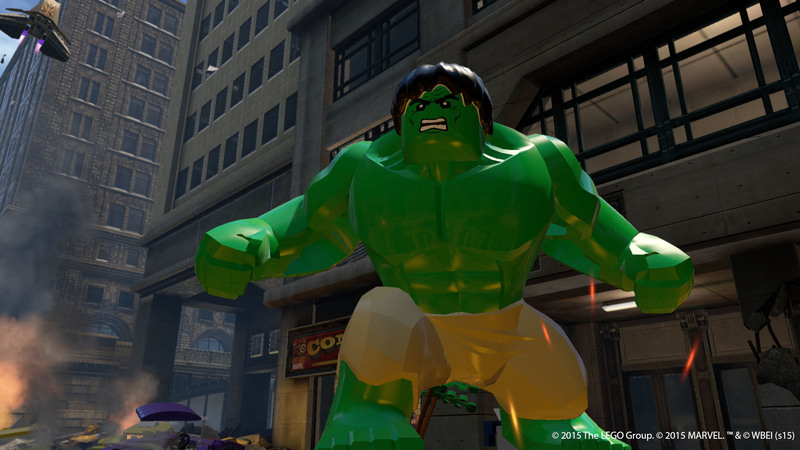 While some entries have been more appealing than others, the superhero cross overs have always been my favorite, which is why when I heard about LEGO Marvel’s Avengers, I could not have been more excited. Unlike the other entries in the LEGO series, Avengers will be recreating moments from the original movie and the latest entry, Age of Ultron, instead of having its own story. Having had a chance to run through part of the game’s campaign while at E3 2015, I was able to see a segment involving the famous Battle of New York scene from the first Marvel’s Avengers movie. While not many characters were available during the demo, I was able to freely switch between Captain America, Hawkeye and Black Widow. Supposedly the whole game will let players explore the full city and stop crimes in progress, but the demo was a bit more limited in scope and only had us rescuing NPCs and putting out fires for the most part. Much like we have seen in previous entries, especially in LEGO Marvel Super Heroes, each character had their own set of special abilities that they could use to help progress the story, or even gain access to secret items. Captain America was still able to lock on to multiple enemies, as well as put out fires with his shield, which was perfect to get past certain areas to free trapped civilians. While Black Widow had the ability to turn invisible, as well as use her guns to shoot at enemies. Hawkeye not only had the ability to use his bow on enemies, but he was able to fire arrows into slots to allow players to be able to use them as poles to swing on. But, on top of those abilities, there were a new set of options that let players combine actions. The only real instance of this (combining actions) was where we needed to reach a new area, so we had to have Captain America launch Black Widow up using his shield, which was an obvious throwback to the first film. This then allowed her to work her way around so that we could progress through the area. Fans of the LEGO series will also remember a number of familiar actions, such as having to break objects so that you can rebuild them to create a new object that can be used or having to use a certain character so that you can tether a hook and pull an item off of a wall by hammering the circle button. Hopefully new additions will also be made, so that we won’t only be repeating actions we have now been doing for years, but nothing new was shown off. While I did enjoy the Avengers movies a great deal, I do wonder just how much content they will be able to pull into this iteration, as the available cast directly tied to the films won’t be able to match the same numbers of the previous LEGO Marvel title. But, with the quirky humor that has always made the series what it is, and the quality of the previous entries, I will be excited to see how this game progresses as we get closer to its fall 2015 release.